“Faces and Features” is an exhibition that opened on Wednesday 30 October and will run until 14 November at the Maulana Azad Centre for Indian Culture. 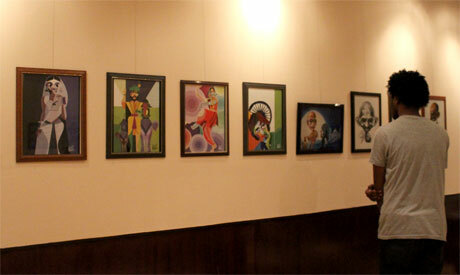 The exhibition consists of caricatures and cartoons representing Indian and Egyptian personalities. The works on display were created by the artists from the Egyptian Caricature Society. In the history of the genre, many caricatures have been controversial, evoking subversive social discourse and challenging the watchful eyes of governmental and public censorship. However, the collection presented within “Faces and Features” remains safe in its choice of satirical commentary. While providing visual and aesthetical values, it does not aim to shake our perceptions of artistic, social or political realities. Artists neither address misconceptions, nor attack subjects with their pencils and brushes. “If all art is the creative depiction of the world around us, caricature is undoubtedly its sharpest genre, representing the human form in delightful and surprising ways,” Navdeep Suri, Ambassador of India to Egypt writes in a booklet accompanying the exhibition. The exhibition is a friendly display of artistic cooperation between the Embassy of India and Egypt. It is also a reminder of the riches of humanity and of people from both countries who have contributed to the eternal development of human kind. A fascinating journey through the works of many Egyptian cartoonists and caricaturists, the display is an important testimony to those who have marked the political and social histories of India and Egypt, and those who have contributed to arts and entertainment. Many of the artists who have participated in the “Faces and Features” exhibition are accomplished creators, such as Taha Hussein, along with young creators: Amal Samir, whose portfolio already includes an array of impressive portraits; Tamer Youssef, currently based in San Francisco, whose caricatures do not spare known international artists and politicians; graphic designer and illustrator Bassem Adham, and Khader Hassan, to name but a few. While some works are artistic representations of their subjects, others are satirical – yet always flattering to the subject – commentaries about known personalities from Egyptian and Indian fields of politics, art, literature, and cinema. The artists have created interesting parallels that underscore the artistic and intellectual wealth of both countries, which has been created, nourished and passed to further generations by many remarkable figures. Some works are simple pen-and-ink caricatures, recapturing our attention with their emancipated features, while others bend towards more classical portraiture techniques, at times charging them with physiognomic accents. Bassem Adham’s work presents Rabindranath Tagore (1861-1941), Bengali polymath and writer, awarded the Nobel Prize in Literature in 1913, alongside Naguib Mahfouz (1911-2006), the Egyptian writer and winner of the 1988 Nobel Prize for Literature. From the literary world, the display includes work by Islam Al-Qusi, portraying Ahmed Shawqi (1868–1932), considered one of the greatest Egyptian poets and playwrights. Al-Qusi’s portrait is an artistic reproduction of the well known old photograph of the poet. “Faces and Features” also presents many filmmakers, actors and comedians such as Egyptian Omar Sharif (born 1932), Ismail Yasin (1915-1972), Fouad Al-Mohandes (1924-2006) and their Indian counterparts: Amitabh Bachchan (born 1942), Amrish Puri (1932-2005), and a young star Aishwarya Rai (born 1973). Adham Lotfy’s canvases capture Shakhar Kapur (born 1945), an Indian acclaimed film director, producer and actor, as well as Youssef Chahine (1926-2008), a well known Egyptian film director. The exhibition would not be complete without representation of India’s thinkers and politicians, who have created an important imprint in human history, including representations of Mahatma Gandhi, Indira Gandhi and Mother Theresa. 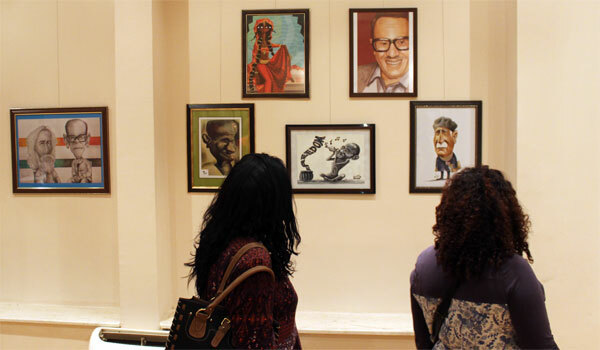 A few works representing Mahatma Gandhi displayed in “Faces and Features” already took part in “Spirit of Gandhi in Egypt“, an exhibition of posters and caricatures of the famous peacemaker, that was held between 2 and 10 October 2013 at the Maulana Azad Centre for Indian Culture.